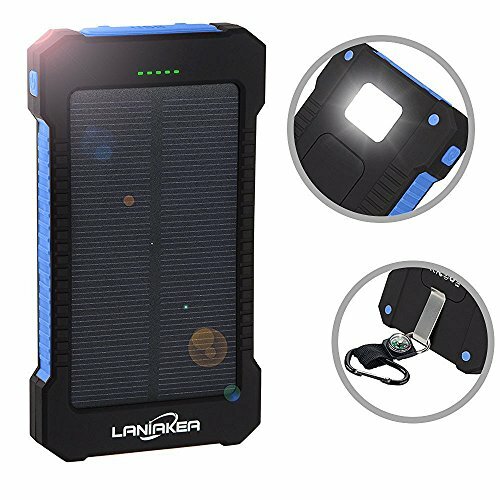 Attention: Solar charger(10000mAh capacity) is for emergency use, not a main charging resource, it takes about 40h to fully charge under direct sunlight, so it is recommended to charge by wall charger. Dual USB Charger Ports(1A/2A): Can fast charge two devices simultaneously. 2A port for iPad/Tablets, 1A ports for phone/Bluetooth or other 5V USB supported devices. Automatic Smart Identification, more convenient and practical. Multiple Protection:Waterproof &dustproof &shockproof perfectly for hiking, climbing, camping and other outdoor activity. 5 intelligent protection systems ensure long lifespan with more than 500 recharging cycle, meanwhile avoid short circuit and over-charge. If you have any questions about this product by LANIAKEA, contact us by completing and submitting the form below. If you are looking for a specif part number, please include it with your message.